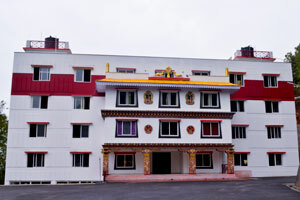 1) Nyingma Institute (Sherda), Martam, East Sikkim. 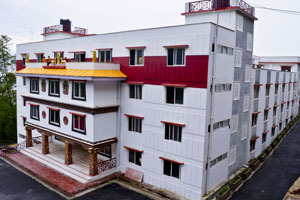 The Nyingma Institute (Sheda is residential Institute to house of around 350 Monks, where they will study and practice Higher Buddhist Studies and Philosophy. The course includes Philosophy, Literature, Metaphysics, Logic, Tantric Studies, Ritual Prayers, Meditation Practices and English and is dedicated to providing a wholesome education. Its education system encompasses the whole spectrum of education right up to the research level. A nine year course is equivalent to an M.A. in students' studies. After completing the nine year course on these diverse subjects, students will receive an M.A in Philosophy. To obtain PhD students may elect to complete three more years of research. After this, conferral of the higher degree of Khenpo will be bestowed to candidates with outstanding personal qualities and teaching ability. The Nyingma Sheda's purpose is to spread Lord Buddha's message of peace and non-violence in the world. 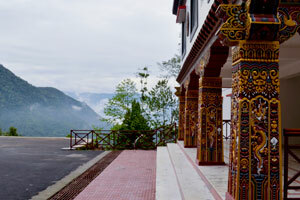 2) Zhitro Lhakhang, "the pantheon of 100 buddhas" Martam, East Sikkim. 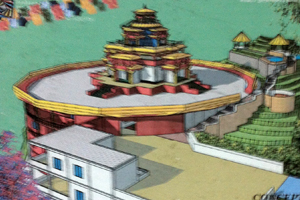 This six story, 200 feet wide mandala will be built in the beautiful valley of Martham, Sikkim, India. 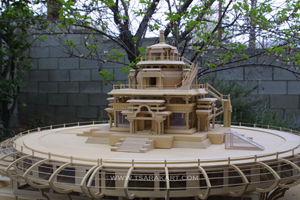 The unique contemporary design of this creation incorporates a community center, overnight guest suites, and a sacred inner chamber upon which the principle mandala resides. Mandala is a spiritual and ritual symbol in Hinduism and Buddhism, representing the Universe. A prominent sadhana, or practice text, is part of a group of bardo teachings which are held in the Nyingma tradition to have originated with Padmasambhava in the 8th century and were rediscovered as terma, or 'treasure teachings' in the 14th Century by the tertön Karma Lingpa. The Zhitro mandala teachings were found in the same terma collection as theBardo. Zhi-khro is a practice of Tibetan Buddhism involving visualizing the body as a composite of the 108 peaceful and wrathful deities. In the practice, the deities are first visualized in mandalas of 58 peaceful and 42 wrathful deities centered in the heart, throat and crown chakra, and then in all the channels and nadis of the body. The zhi-khro, which translates as the peaceful and wrathful deities, is considered part of the inner tantra. It is actually a condensed teaching based upon the essential meaning of the Guhyagarbha Tantra combined with the views expressed in the anu and ati yoga teachings. 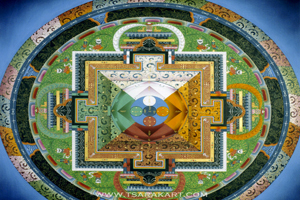 Many great masters have said that the zhi-khro teachings are the inner tantra of the inner tantra. In this case we're not making distinctions among the various inner tantras, nor between the creation and completion stages, but joining them all together. This is the union of rigpa and emptiness, the oneness of birth, death, and life experiences. There is no basis for discriminating because all are aspects of one true nature. Nothing is rejected or exclusively accepted. This teaching is known as the one that unifies everything into a single state.